Sue, over on Sue’s Words and Pictures, mentioned that, when in doubt, she tends to classify unknown plants as “probably some kind of vetch”, and I’m pretty sure that today’s photo falls into that category. I’ve always called this sort of thing Bush Vetch, but a recent chat with Google (hoping he would confirm my superior knowledge of the natural world) proved frustrating. At first, he appeared willing to bolster my ego, producing several pictures very similar to mine, plainly labelled so as to induce feelings of smug satisfaction. If I had any sense, I would have left it at that and gone on my way secure in my infallibility. However that first flush of over confidence pushed me to cross the Rubicon. 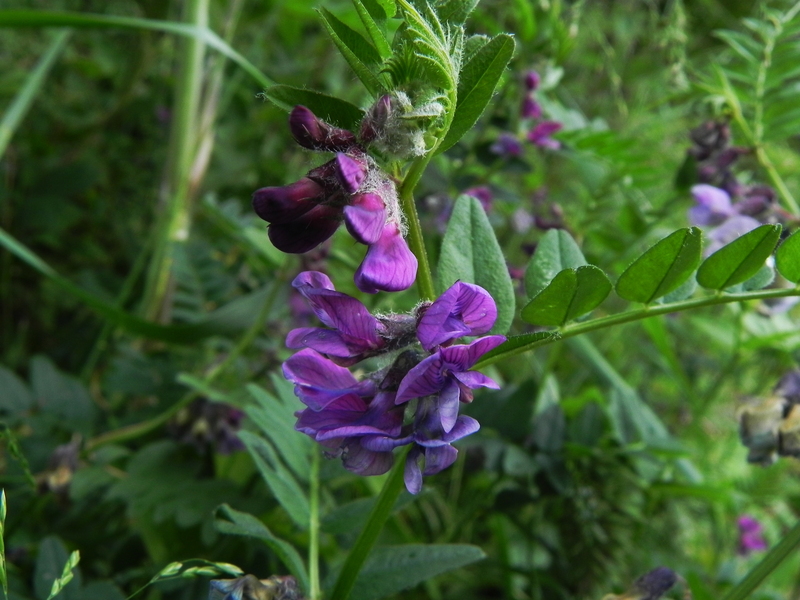 What then was the difference between my Bush Vetch and, say for instance, Common Vetch? In response to this enquiry Google produced another large selection of images – as close to identical to the first set as to cause me to wonder if he had misheard me. A quick application of the ‘Back’ button showed that the second set of photos was, in fact, a different selection. However, the differences among the individual pictures in each set seemed to be greater than the supposed differences between the sets themselves. I wish Linnaeus had just put a bar code on each plant instead of messing with all that Latin. We went away. Well, I mean to say, we are away, or perhaps, depending on when you’re reading this, we might be back now, or even travelling back at this very moment, or at that very moment. Just after I posted last weeks in-depth psychological analysis of the current situation, we left our pastoral view of the Cumbrian countryside and our peacefully grazing cattle. We drove for six hours, until we arrived at our holiday destination – a cottage in a lovely rural location. Complete with views of the Welsh countryside and peacefully grazing cattle. They do say ‘A change is as good as a rest’, don’t they. While we have been too busy having a lovely holiday to spend too much time talking to the locals, (other than the resident Blackbird, of course) there are a few things we’ve noticed. Geographically speaking, we are still on the west coast, but we are now a couple of hundred miles farther south. 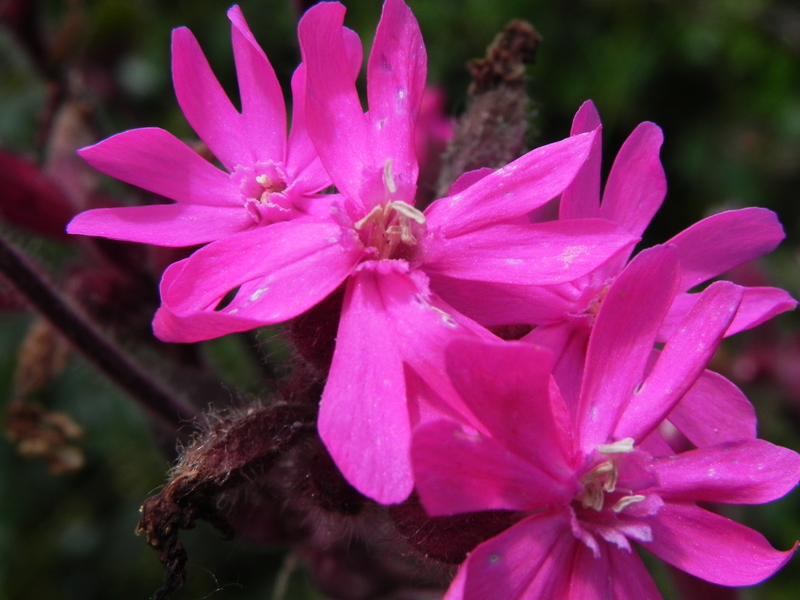 When we left home there were a few places where patches of Red Campions were starting to put forth the odd bloom, with a promise of a full display in a few weeks. Down here, they already have on their, freshly washed and pressed, full summer uniform, and are standing around in groups, chatting idly, just waiting for word to arrive – that summer is really here. All Right On The Night. ‘Quickly, Darling, quickly. I need my new point shoes for my next number and my ribbons are still on my old shoes. Here, here they are. ‘Yes, yes. I know. But this is the dance before mine, so there’s three minutes yet. They’re just pinned on with safety pins, there look, I’ve already undone this one. ‘Well, they’re new shoes, Darling – and I haven’t had time. It’s been one rehearsal after another for days, then, when I get home, I’m just too knackered to think about sewing ribbons on. ‘Don’t shout at me, Darling, I really will do it after the show tonight, I promise – if there’s time. Oh, quickly Darling, quickly, this is their finale music. Yes, bit tighter, please. Don’t forget to tuck my ends in. My left ribbons. Look. That’s better, thank you Darling. See, plenty of time, oops, this is my intro. ‘Excuse me, everyone. I need some space. Eve, as you all know, was made from Adam’s rib. Even the most unobservant observer must have notices that, these days at least, Eves come in assorted shapes and sizes. Even if you had the right kind of ribs readily available, I suspect that the skills required are not so easily found. The ability to make Eves from ribs has died out – and now must be placed on the Red List, along with flint knapping, bronze casting and washing up without a dishwasher. I did check on Google, thinking there might be evening classes or a part-time course, but no luck. 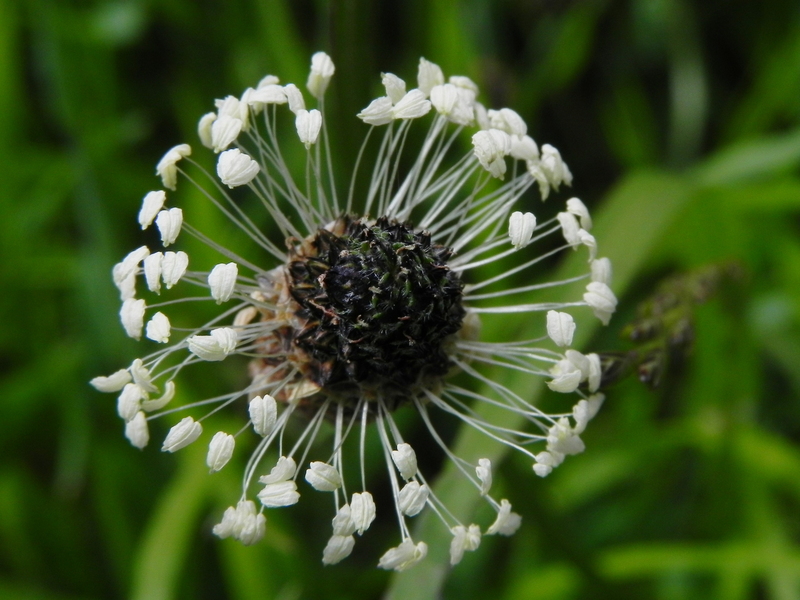 The reason for this sudden concern with ribs, is that today’s picture is of Ribwort. The flowers look just like a spaceship – or one of those fairground rides, but the leaves have very marked ribs down their length. I can vouch for the fact that a Ribwort leaf can be rubbed on nettle stings to good effect. Whether it will perform the hundred and one other cures attributed to it, I can’t say. 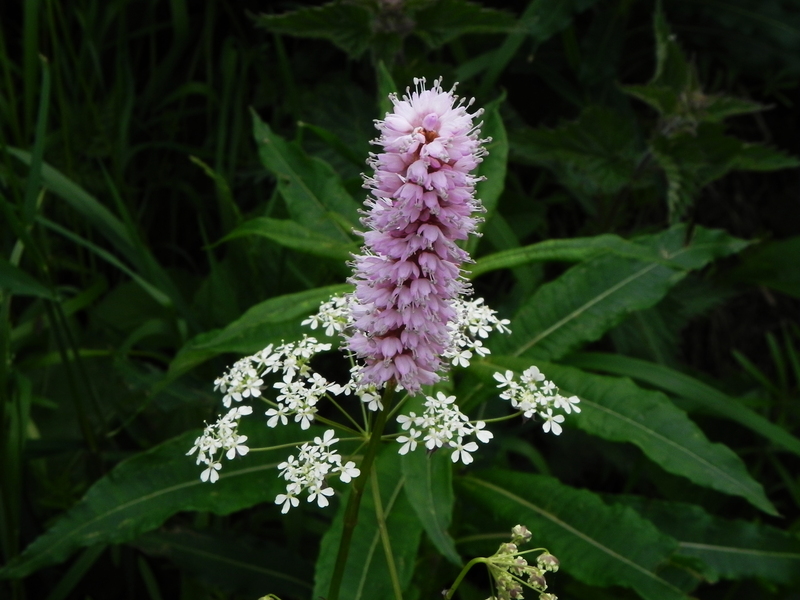 Quinquenervia is the Mediaeval name for the plant – very roughly translatable from the Latin as Five Ribs. This leads us to today’s conundrum. If you could find workers with the necessary skills, and if you found yourself a little short on this months quota, could you use Ribwort leaves to make five Eves at a time?